Tuttle, Jim: Eject! The Complete History of U.S. Aircraft Escape Systems. MBI Publishing Company, St.Paul, MO, USA, 2002. ISBN 0-7603-1185-4. 256 pages. 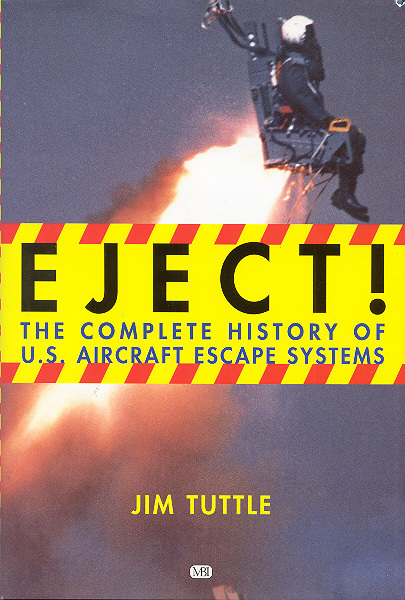 Another tidbit from the DocBoink ruminative cerebral processing computer: I just finished reading Jim Tuttle's book EJECT in its entirety, having been delayed in obtaining a copy since its publication in 2002. Others who have read through it have given varying opinions on it, which puzzled me, but added to my desire to finally getting around to reading it. Bluelight, in his comments made some time ago, said that the book was somewhat disappointing, if I recall correctly (advise me if I err in this assumption, Bluelight--the memory isn't as acute as it used to be). That having been said, I have to agree that the book is more than a little disappointing--especially since Tuttle titled it (somewhat grandiosely, I feel) "EJECT! The Complete History of US Escape Systems". It is FAR from any sort of complete history of this complex and increasingly obscured subject (as years pass, valuable historic data is being lost forever), but it also provides some interesting insights into areas previously sparsely dealt with. Overall, I'd say it is as disappointing as it is promising: the two aspects together yield a book that is simultaneously useful and yet somewhat incorrect in many of its assessments. Typical of the errors found in this book is the persistent referral to "Zero-altitude/Zero-speed" E-seats as "Zero-altitude/Zero-G" seats. They are, of course, not "Zero-G" seats at all, but rather "Zero forward speed" designs. Tuttle strangely uses the correct term in one of the book's illustrations, but everywhere else (in the book's text) uses the incorrect term of referral. This suggests either he wasn't aware of the error at all, or was simply extraordinarily careless in not catching this rather important oversight when the book was proofed. We are informed that Tuttle was for 23 years "Senior Cockpit Design Engineer" for North American Aviation and later for North American-Rockwell, but the plethora of errors in reference and the great number of incorrect statements made throughout his book suggests that egress was not a particularly familiar technical subject for him--senior NAA cockpit 'designer' or not. The book's publisher touts Tuttle as an "industry insider" on its dust jacket and in the author bio blurbs, in an attempt to establish Tuttle's bona fides as an expert in the area he has chosen to write about. However, it is a mistake to assume that just because one is an aeronautical engineer and industry 'insider', one is extremely well-versed in the chosen subject area of technology under examination. Tuttle clearly does not have a lot of intimate knowledge of the very specialised technology that comprises egress engineering, regardless of his other (probably sterling) qualifications as an aviation engineer with many years of experience. Thus, his book is no more the long-awaited "ultimate reference" to egress history that we have all been hoping would appear than any other previous attempt, but constitutes simply another interesting perspective on a subject that has yet to be covered in totally satisfying completeness. One example of this "incompleteness" in Tuttle's book is that fact that his sum total information on the most interesting years of egress research and design test work (the earliest period of primary modern egress study, a period stretching roughly from the end of the Second World War through about 1954) is so sparse and perfunctory as to yield almost no useful definitive information about the very early manual and semi-automatic seats at all. This is a critical oversight, in my humble opinion. A list he presents of several important early jet aircraft designs simply affirms that the aircraft in question had an E-seat built by the manufacturer...period! Further surprising me, he utterly fails to make mention of the fact that the very first production USAF jet aircraft to have a production E-seat (manual) installed at the factory was the Republic F-84 Thunderjet. The early Republic Thunderjet E-seat was a very important development that should have been explored in some further detail, and yet Tuttle basically makes less than a full sentence reference to the aircraft and leaves the impression (incorrectly) in the reader's mind that the Lockheed P-80 Shooting Star was the first operationally E-seat equipped USAF jet aircraft. These are just a few specific flaws and faults (among a number of others) that are hard to overlook, in view of the fact that the early years were the most important years of egress engineering (when almost nothing at all was known about the physics and ergonometric principles that would allow SAFE human occupant egress--that is, with minimal ejection-produced injury). If I had been Tuttle, I certainly would have NOT chosen to suggest that this book was the "complete history" of egress technology history in the USA, but rather an attempt to chronicle some of it within the constraints of time and available research data that obtained. I am sure others have read the book and arrived at this conclusion, as well. Having written a book on NBC protection that suffered from similar concerns, I am well aware of the fact that every author is best presented in a somewhat 'humble' light--regardless of the promotional hype that a publisher may foist off on potential readers to sell more books. On the positive side of things, I found that there was a considerable amount of hitherto lightly covered material that was of interest and some areas of work Tuttle referenced provided me with worthwhile new insights into this still somewhat arcane and poorly recorded area of important aviation technology. Hi Doc, Yes, you are correct. It was I who made the comment some time back that this book was 'somewhat disappointing'. In fact I think I made the point that it should have been labelled 'Stories about US Escape Systems' rather than 'The complete history...' In later years books on military aviation and related topics have been swamped with personal accounts of people 'who were there'. In the right place it is a very good idea and it adds tremendously to the understanding of the operational environment an aircraft was used in or its flying characteristics. In a 'complete history' on a technical subject like ejection seats I would have expected more drawings and diagrams etc. explaining the intricacies of the development steps and the relatice merits of each development stage. I was disappointed to see that the early Weber seat design for the F-106 was not included at all. As you have described earlier it was unique by rotating to a horizontal position above the cockpit before being released. That said, however, the book does indeed have some interesting information so it is still on my shelf. into the floor of the desert, instantly killing him. Photos of the capsule on the ground show it sustained severe crush damage to the forward lower area structure and estimated G forces of impact were reasoned to be unsurvivable. These early 'escape pod' systems were relatively simple in that they did not provide for the occupant to ride the capsule down to the ground--he had to manually bail out of the capsule while it was high enough to allow a standard parachute bailout in order to survive. Later and far more sophisticated systems, such as those used in the B-58, XB-70, and F-111, all allowed for their crew to stay in the capsules and ride them to a (reasonably) soft landing on the ground (or water).